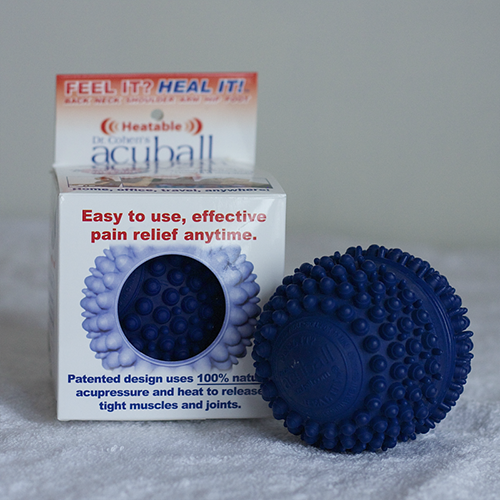 The Acuball’s patented design features apply 100% natural acupressure and heat: relaxing tight muscles & connective tissue, enhancing joint movement, reducing nervous system irritation and creating a significant de-stressing effect, this is the most amazing mayo-fascia release you will ever encounter. The Acuball’s patented design features apply 100% natural acupressure and heat: relaxing tight muscles & connective tissue, enhancing joint movement, reducing nervous system irritation and creating a significant de-stressing effect, this is the most amazing mayo-fascia release you will ever encounter. This ball can aid in blood flow stimulation, releasing natural pain-killers and relieve sore, tight areas. The large ball has a build in spinal belt great for back care. Every fitness professional needs one.